This easy 7.5 mile circular walk starts at The Boot Inn Lapworth on the B4439 SE of Hockley Heath, a welcoming old established country Inn. 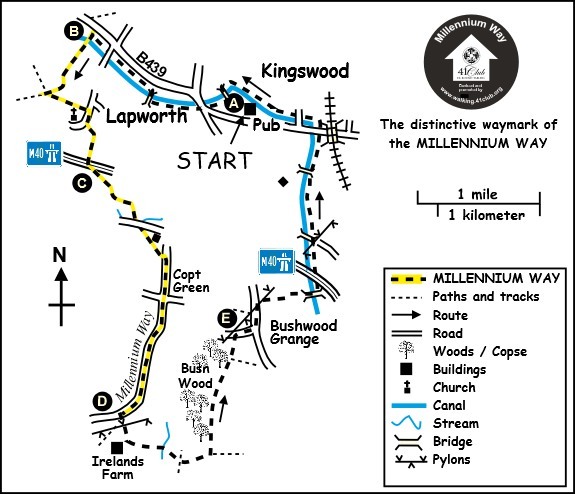 Initially the route follows the Stratford-upon-Avon Canal, leaving this at Drawbridge Farm to follow a delightful section of the Millennium Way where you will be guided by the distinctive black Millennium Way waymarkers. Find out more about the walk by clicking on the information icon. At Irelands Farm the route leaves the Millennium Way following along some delightful paths, eventually to rejoin the canal where it passes beneath the M40. There are two stiles over which your dog may need help, otherwise a very dog friendly walk. Our walk starts from the Car Park of The Boot Inn. Exit to rear of the car park via the track which leads to the canal towpath. 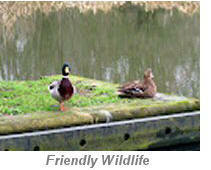 Go ahead over the small bridge (No 33) then turn L along the towpath keeping canal on left. 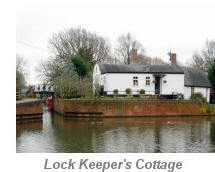 Continue gently uphill past a flight of locks to reach a small cottage. Go left over bridge 32 and stay on towpath, now with canal right. When you reach bridge 30, cross bridge to reach towpath on the other side and stay with canal left passing several canal side dwellings. Stay ahead under bridge 29 until you reach drawbridge 28. Here you are joining The Millennium Way where you will be guided by the distinctive black Millennium Way waymarkers. Turn left over the drawbridge down vehicle track into Drawbridge Farm then pass in front of farm buildings to take kissing gate just to left of right hand gate. Go with fence and hedge left to take far corner gate to next field then continue downhill to take far left corner gate. Go ahead through narrow field to find another corner gate. Take gate, past dew pond and continue with hedge left to take gated bridge over stream into field. Stay up field towards tower of St. Mary's Church, Lapworth. Exit field by stile adjacent to metal gate and stay ahead towards church taking stile to road. Turn right on road, and after 120 paces (just before Green Acres) go left down drive by wooden footpath sign, passing tall Leylandii hedge right, through gate then follow block paved driveway past greenhouses to end, to find ground staff buildings with gated courtyard. Turn left here onto gravelled drive and go ahead 60 paces with hedge right then take hedge gap right ( waymarked Millennium Way ) to continue line down towards motorway, now with hedge left. Take the gap through tree line ( by solitary waypost ) and take stile to vehicle track and continue over motorway bridge. After crossing bridge, take stile left and go down steep steps keeping to line of fence at bottom of steps. (Do not veer right to footbridge) At the end of fencing take bridge stile to field staying ahead across centre of field to pass through gate in gate then under power lines to further gate within a gate to exit. Head across narrow part of field and take kissing gate through scrub into field. Stay ahead with hedge left to exit by far left corner kissing gate to rough vehicle way. Go right on vehicle way down to lane. Cross lane to take bridge and stile, turning immediately left through kissing gate to field. Go with hedge left around field edge to far corner kissing gate. Take gate and bridge to go through short scrub into field then go left with hedge left. Approximately half way down field pass gap left and after 25 paces take stile on left and go diagonally slightly left keeping hedge left to take hidden corner stile to road. ( Look out for lovely blackberries in hedge during August.) Go right on road for approximately 1/3 mile to reach staggered crossroads then go directly over, past the post box and continue along Ireland's Lane. After approximately 3/4 mile go left down farm track towards Ireland's Farm. Here we leave The Millennium Way, so ignore footpath immediately on right and continue down track passing under power lines. Just before the entrance to the farmhouse go left down wide grassy track. At the end of the track take metal gate and cross a short section of field to take further metal gate and stile across stream. Proceed ahead up field keeping wire fence right to take stile adjacent to wide metal gate to farm track. Turn right for 10 paces then go left through gate (signed Heart of England Way). Go initially with hedge/trees right following the line of the hidden dismantled railway. The path then swings left towards a double metal gate. Here we leave the Heart of England Way to take the gate and continue forward to walk gently uphill with trees left. Where the track levels off you will find a welcome commemorative bench on which to take a well earned breather to enjoy the spectacular view. Continue along track past a small wood of statuesque pines to take wooden gate and narrow fenced track behind dwelling. Stay on access lane to reach road. Turn right on road to reach T-junction then turn L in the direction of Lapworth. Continue past High Chimneys Farm and just before you reach the overhead power cables turn right and go through kissing gate. Go ahead with wire fence left ,and after approximately 100 yards, just as the track starts to swing left look out for concealed kissing gate in hedge on right. Take kissing gate and wooden plank bridge into field and go left with hedge left towards the motorway. At the field corner take kissing gate into next field and go left for a few paces to then turn right by the way post proceeding across field towards motorway. On reaching a way post at the far side go left along field edge keeping wire fence and wood right, to find another waypost and path right which will take you onto the canal towpath via metal gate. Cross bridge 39b directly ahead of you then go left on towpath to walk underneath the motorway. As we leave the motorway behind us we are soon back into a delightfully tranquil section of the Stratford Canal. Shortly we pass a wooden bench in memory of Doug Smith, the creator of Lockmaster Maps. At bridge 39 there is an information board which is worth a look. Stay on towpath with canal left and on reaching bridge 37a cross over to the opposite towpath and stay with canal right. Shortly we pass Kingswood Junction where the Grand Union Canal joins the Stratford Canal. Proceed past the marina and under road bridge 35. On reaching bridge 33 we leave the towpath to turn left back into the car park of The Boot Inn. The walk begins with a lock flight on the Stratford canal. This canal was almost lost! 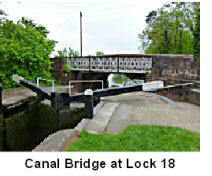 Attractive canal bridge design at lock 18 (picture). Built between 1793 and 1816, the canal was an important link from Birmingham to the river Avon, but with the coming of the railway, traffic declined until in 1958 Warwickshire County Council applied for an abandonment order. This galvanised the Inland Waterways Association and National Trust into a restoration project, using prisoners from Winson Green. Reopened in 1964, it is now hugely popular. Dating from 1100AD and augmented over 300 years, this beautiful church is a Grade 1 listed building. The interior is worth a look. There is a reliquary chapel, visited by pilgrims, above the West porch. As you explore, look at the reredos, depicting the Last Supper and note the little faces staring down. The M40 is crossed twice on this walk. After the first crossing the Millennium Way enters the Tapster Valley. 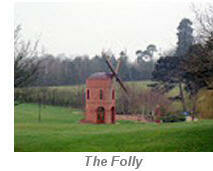 On a hilltop to the south-west is Tapster Mill, the site of a former windmill. Try to imagine this valley before the motorway arrived. 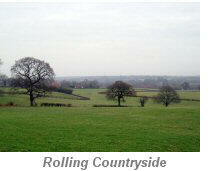 It was an oasis of calm in rural Warwickshire. Now, a constant roar accompanies your footsteps. Still, that’s progress! The Catesby family (of Gunpowder Plot fame) were resident in this area. The manor house was probably at Lapworth Hall, today Ireland's Farm, and in the 17th and 18th centuries the house of the Mander family ( of paint and varnish fame) of Wolverhampton. More recent Lapworth notables include Bob Davis aka Jasper Carrott, Andy Townsend ex-footballer and TV pundit and Tony Iommi, the guitarist and founding member of Black Sabbath, who currently resides near the village. Here the Stratford and Grand Union canals are connected, the marina and sideponds providing an attractive grouping as the walk ends. 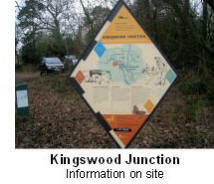 Kingswood received a station on the Birmingham and Oxford railway in 1852. Railway workers joined the canal workers in the village. By the 1900’s the rich businessmen of Birmingham were building villas here, enjoying the rural life and commuting to the city. 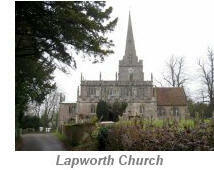 The station was renamed Lapworth in 1913.